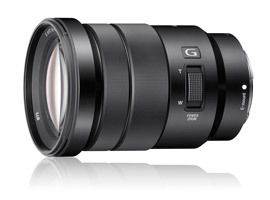 Debuting back in 2013, the Sony E PZ 18-105mm F4 G OSS is a moderate-speed E-mount zoom designed for the Sony APS-C format mirrorless models. Intriguingly, it features the old Minolta G-moniker implying high-end optical construction on par with Canon’s L series and Nikon’s ED range. As the equivalent to a 28-164mm zoom, it has a 5.8x zoom range and features two ED glass elements and no less than three aspherical surfaces. It is, however, the inclusion of optical stabilization, a constant /f4 maximum aperture throughout the range, and a power zoom option that shows it is a zoom that is particularly suited to video users. Besides the fixed or variable-speed zooming and constant maximum aperture, it has a stepper-type focusing motor, and circular aperture opening consisting of 7 blades for rendering rounded highlights and smooth transitions to out-of-focus areas when using differential focus. The optical construction consists of 16 elements in total arranged in 12 groups, and a minimum focus distance of 1.48’ (45cm). With a 72mm filter diameter, the lens measures 4.33 x 3.07” (110 x 78mm) and weighs 15.06 oz (427g). It is available for around $599 (USD). 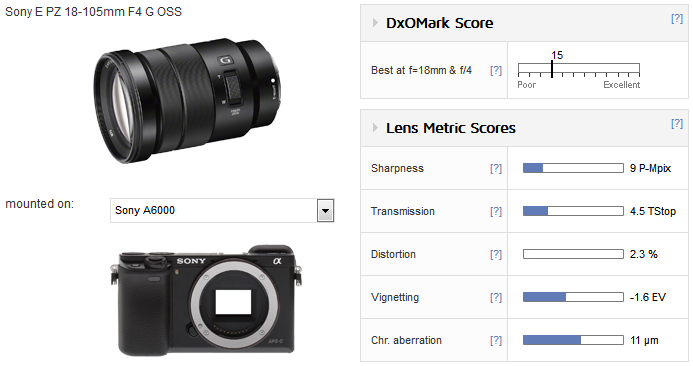 With a DxO Mark lens score of 15 points on the Sony A6000, the PZ 18-105mm is a solid performer overall, especially given the zoom range. It has good center sharpness on the 24-Mpix A6000 throughout the range, and relatively high 9 P-Mpix sharpness. Edge and corner sharpness are lacking, however, and even when stopped down, the sharpness in the centers rarely extends across the frame. It also has rather high levels of pincushion distortion (somewhat unusually from 18mm onwards), and some troublesome chromatic aberration at either end of the zoom range, from 18-24mm and then reoccurring at 105mm. Fortunately, this is restricted to the corners, but it occurs at all apertures. The two lenses perform at a similar level, which is encouraging for the PZ 18-105mm F4. It even has slightly higher peak sharpness and can maintain sharpness at longer focal lengths. It is sharper centrally at f/4 at 50mm than the Zeiss and still has good central sharpness at 105mm, as we mentioned previously. At f/5.6 however, the two perform similarly, with the Sony PZ 18-105mm exhibiting a very slightly wider central core of sharpness at the longer focal lengths. 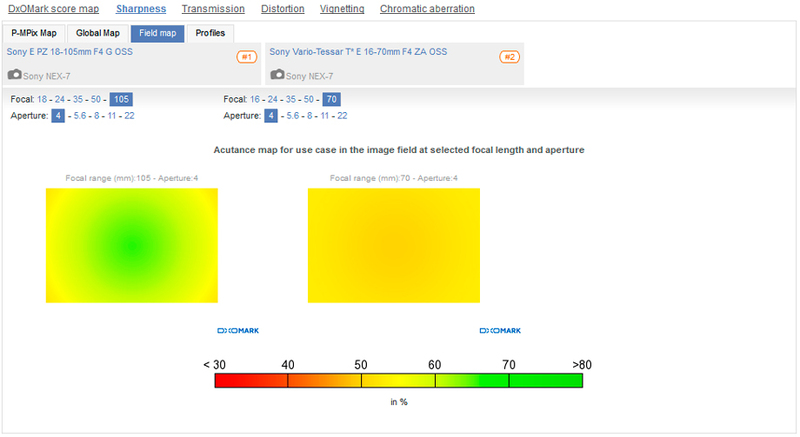 However, the Zeiss is superior at 35mm, where it performs outstandingly well for a zoom. Nevertheless, that’s arguably not that significant for zooms like this. 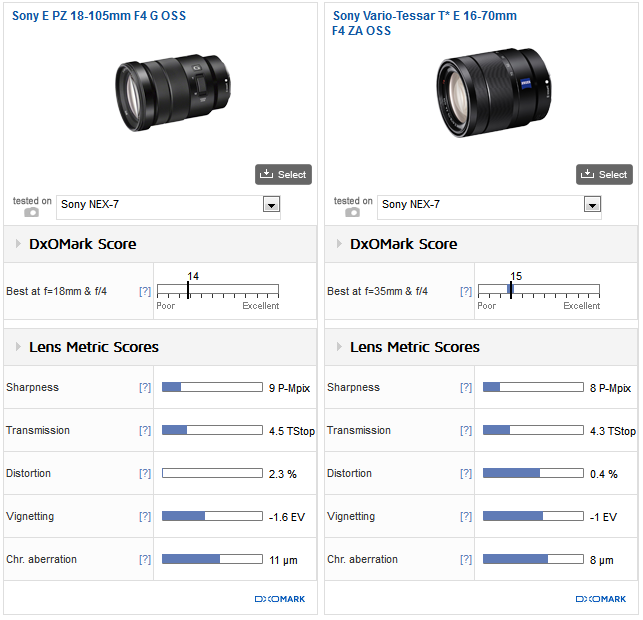 At T4.5 versus T4.3, the Sony is marginally slower, which is slightly disappointing, and of course the Sony has higher distortion and more noticeable vignetting at the longer end of the zoom (50-70mm) than the Zeiss. It also has higher levels of chromatic aberration at the wider end, though it is restricted to the extreme corners. It might not have the Zeiss badge, but the Sony E PZ 18-105mm F4 G OSS has good center sharpness throughout the whole zoom range, and that includes the initial aperture where zooms like this are usually poor, and particularly so at the longer end of the range. The downside is that it’s not as well corrected in other areas as the Sony Zeiss E 16-70mm F4 ZA OSS, with which it is often compared. 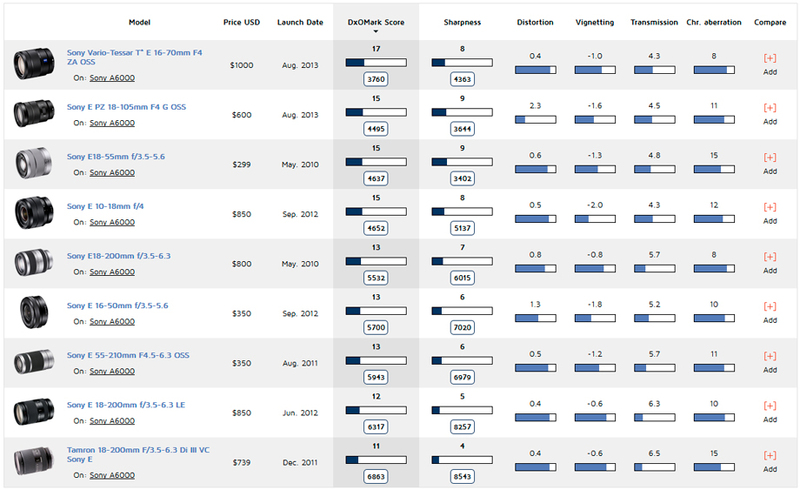 It still wouldn’t be an easy choice, even taking into account the $400 premium for the Zeiss. However the longer reach of the Sony is attractive, and for video users especially, the power zoom option may just swing it.